reinvigorating its support of four key industries. he Malaysian Investment Development Authority (MIDA) is leading new efforts to facilitate foreign direct investment into key industry sectors in order to meet objectives set forth in the Economic Transformation Programme by 2020. The plan stresses increased investment in several sectors that will help transform Malaysia into a higher-income economy complete with the infrastructure and labor supply necessary to sustain the target sectors into the future. Oil and gas, biotechnology and electrical and electronics are among the sectors on a list of National Key Economic Areas identified as central to Malaysia's transition to a high-income nation. Aerospace is another sector that MIDA is targeting with new and improved investment promotion programs and other resources as this, too, is deemed an important industrial contributor to the national transformation. Oil and Gas. Malaysia's oil and gas sector has been a major contributor to national GDP since 1972. Malaysia aims to be the regional hub for the oil and gas sector, similar to Texas for the United States. The government established Malaysia Petroleum Resources Corporation (MPRC) in 2011 to further develop the infrastructure and human capital necessary to support growth of the sector and introducing new incentives for energy companies, including petroleum trading companies, to locate operations in Malaysia rather than elsewhere in the region. MIDA has facilitated global manufacturers and service providers such as Aker Solutions, FMC, Halliburton, Cameron, Technip, Schlumberger and Baker Hughes to set up their operations in Malaysia. Their presence has not only benefited the oil and gas sector, but also the machinery and engineering sector, in terms of technological progress, skills development and outsourcing requirements. Malaysia is very keen to sustain its current production and to grow the services sector, including establishment of a trading and petrochemical hub and developing downstream services to make the area friendlier to investors coming in. "Malaysia has deep water ports and is right in the middle of key shipping lanes," says Dr. Mohd Emir Mavani Abdullah, CEO and President of MPRC. "Efficiency already is in place, and that will attract oil traders to Malaysia, as will our political stability." The new Global Incentives For Trading (GIFT) program will, too. Designed specifically for petroleum-related trading companies registered with the Labuan International Commodity Trading Company, GIFT includes a 3-percent corporate tax on chargeable income, full exemption of director fees paid to non-Malaysian directors and 50-percent exemption on gross employment income for non-Malaysian traders and tax exemption of stamp duties for Labuan transactions, among other measures. More information on the program can be found at www.mprc.gov.my. Biotechnology. Malaysia, being one of the 12 countries in the world endowed with mega diversity, has all the ingredients for a successful biotechnology industry. Cognizant of the immense potential benefits which biotechnology can bring, the government has identified biotechnology as the next engine of economic growth for the country. The biotechnology industry is also one of the growth sectors under the National Key Economic Area (NKEA) plan, which will drive and contribute towards Malaysia achieving its goal of becoming a developed nation by 2020. Currently, the biotechnology industry which includes agriculture, healthcare and industrial, contributes about 2 percent of the GDP. It is estimated that by 2020 the industry will contribute approximately 5 percent of national GDP with total investments of about RM8.0 billion (US$2.6 billion) and create 280,000 new jobs. As a central investment agency in Malaysia, MIDA is emphasizing development and promotion in the sector with high value-added, capital and technology-intensive and knowledge-based industry. MIDA is organizing trade and investment missions to capital- and technology-exporting countries such as the U.S., South Korea, Japan and Europe. Similarly, it is organizing missions to new sources of FDI-exporting countries, such as India, as well as Specific Project Missions (SPMs) to attract FDI in specific targeted industries such as biopharmaceutical, new chemical entities and biochemicals. Malaysia offers good value propositions and a competitive eco-system to prospective investors, particularly in the area of research and development (R&D). MIDA provides and facilitates platforms for research collaboration between investors and research institutions and institutes of higher education. MIDA is also creating a biotechnology eco-system by providing very attractive fiscal and non-fiscal incentives to promote the biotechnology industry. Furthermore, MIDA has been empowered as the central investment approving authority with the establishment of the National Committee on Investments (NCI) that enables MIDA to approve incentives in real time and respond quickly to investors. Aerospace. This sector has long been considered a growth sector for Malaysia, particularly in the areas of maintenance, repair and overhaul (MRO); parts and components manufacturing; avionics and systems integration; and aerospace training and education. The government launched a National Aerospace Blueprint in 1997 to cultivate the sector, and the Ministry of Finance revised and enhanced incentives for the industry in 2010. MIDA assists aerospace investors by providing information on aerospace eco-systems in Malaysia, advice and assistance on project implementation, government support in terms of such incentives as tax exemption and grants and work-force availability information. More than 30 public and private institutions in Malaysia are producing the sector's required human resources, ranging from pilots and air traffic controllers to graduate engineers, technicians and mechanics. Electronics & Electrical. Malaysia's electronics and electrical sector — one of the country's signature industries and a central one to its Economic Transformation Programme — saw considerable growth in 2011. Investment in new projects in the sector jumped 20 percent over the 2010 level. More than 90 projects with investment of more than RM100 million (US$30 million) were approved, 11 of which were valued at over RM1 billion (US$330 million). MIDA's Malaysia Investment Performance 2011 report, issued in February 2012, identifies where MIDA will focus its resources in this key area: "The future focus of the industry in Malaysia is on green and smart technologies such as LEDs and the solar industry. In addition, new products such as advanced integrated circuits, high brightness light emitting diodes (HBLEDs); radio frequency (RF) and Microelectromechanical Systems (MEMS) devices are also given emphasis due to their growth potential. These industries are being promoted by leveraging on the ecosystem and supporting cluster development." This Investment Profile was prepared under the auspices of the Malaysian Investment Development Authority. 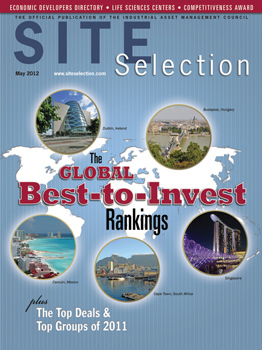 expanded Investment Profile to appear in the September 2012 issue.